Patrick Daly is good hockey player. More than that, by all accounts, he is a good kid. 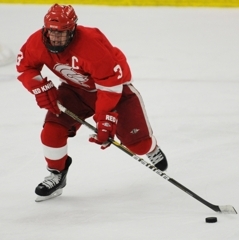 Daly, a senior defenseman, committed on Sunday, Jan. 9, to play for the University of Wisconsin. In explaining why he chose the Badgers, Daly didn’t talk much about the facilities or the school. He did, however, describe at length his impression of head coach Mike Eaves. The 6-foot, 180-pound Daly has scored three goals and added 12 assists this season for the Red Knights, who are 10-1-0 and are ranked No. 3 (tied with Hill-Murray) in Class 2A. 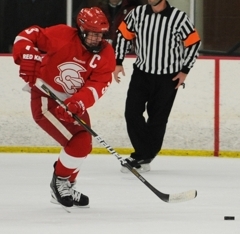 Daly, a co-captain who was a standout in the Upper Midwest High School Elite Hockey League this fall, leads the Red Knights in plus/minus with a plus-27. 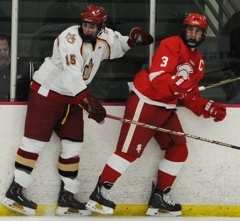 Last season Daly was the state’s top-scoring defenseman with 11 points in five games before suffering an ankle injury that knocked him out of 17 games. He eventually returned to the Red Knights’ lineup, but was not at full strength. “When he broke his foot last year, I don’t think I saw him pout once,” Pauly said. “And I wouldn’t have blamed him if he had. I’ve had kids in similar situations where it looked like someone shot their dog or stole their dog or all of the above. Daly also made an official visit to Nebraska-Omaha, and he received a scholarship offer from the Mavericks. Daly said he made unofficial visits to Colorado College, Minnesota-Duluth and Bemidji State. He is expected to play for the Badgers starting next season. Bill Butters, the Badgers’ top assistant, has a reputation as a defenseman guru. The former White Bear Lake star spent 10 years as an assistant coach at the University of Minnesota, where he worked primarily with the Gophers’ defenseman. Pauly said it was Daly’s standout skating ability that caught Butters’ attention. 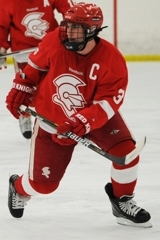 Daly is also a baseball standout, and he will serve as a Red Knights captain this spring. “The fact that he is captain there too just shows that it is not a hockey thing,” Pauly said. “They love his ability as a player, obviously. But (the Badgers coaches) are character guys and they are looking for character players.